Shelter available in a galvanised or powder coated RAL code colour finish with galvanised cycle stand toastrack. Anti-climb roof and end frames with 5mm polycarbonate panels. 14 Bike Space BSC26 (2124): 6000mm length x 2100mm width x 2200mm height. 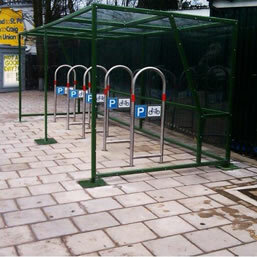 28 Bike Space BSC26 (2125): 12000mm length x 2100mm width x 2200mm height.